Author Christine Trent easily and deftly transported me back to Paris and London in the late 1700s when France was on the brink of the Revolution. I love stories—especially if they are well told—whose main character goes from rags to riches despite almost impossible odds. Claudette Laurent is left penniless and alone after tragically losing her home and parents, but she prevails using her wit, talent and kindness. She experiences hardship, adventure, danger, romance and royal intrigue that keep the pages turning quickly. The fact that Claudette was a dollmaker added realism, depth, and artistic quality to the story. I learned about the art of dollmaking as Claudette’s own life transformed. 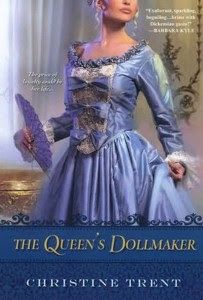 Fictional characters blended easily with historical figures that the author brought to life, mainly Queen Marie Antoinette, King Louis XVI, the Princess de Lamballe and Marie Grosholtz. The opulence of the royal court contrasted with the rough streets of Paris creating the setting for the French Revolution that followed where Claudette’s loyalty to the queen almost costs her life. The plot is rich and captivating with well-developed characters that move it along quickly. I was delighted to find it a clean read, although for those of you sensitive to violence the book does describe some of the gruesome and bloody massacres that took place during the French Revolution. But this is minor in the totality of the story. Two men dominate Claudette’s heart and they are very different. Jean-Philippe is passionate and this will lead him to make choices that cost him dearly. And then there is William. If there is one thing I found lacking was the romance between Claudette and William. It began well but the long courtship allowed for the romance to fizzle down to almost nothing. I was hoping for more passion between them, which did not even come through when they were reunited. However, the premise of the story and the cast of characters make up for any lack in this aspect. I thoroughly enjoyed reading this novel and I look forward to reading more books by this talented author. Disclosure: I won this book from Marcia's Mailbox Monday Read it Forward Program at The Printed Page. I was not compensated in any other way, nor told how to rate or review this product. This book sounds wonderful! Isn't Marcia the best about sharing her books?! Yes, she is so generous! I was happy to win this book from her. Hmm I'm going to put this on my TBR list on goodreads! There's a YA book out there that has striking parallels to this plot, it sounds: THE RED NECKLACE by Sally Gardner. Anyway, I'm interested! Thanks for such a good review! Thanks for referring this other book. Will check it out!